For caries excavation, cavity preparation, and root canal access. Smaller sizes often used for single surface cavities, medium sizes often used for interproximal cavities in anterior teeth. For producing undercuts in cavity preparations; slightly rounded edges on the blade corners reduce chipping for a smoother cut. Ideal for amalgam removal; may also be used to contour the occlusal anatomy of final restorations and for flattening pulpal and gingival walls. Produces an undercut preparation with round internal line angles. For producing preparations with straight parallel sides and flat floors, gaining access to carious dentin, establishing preparation form, and creating retentive locks. Cross cut burs have more cutting edges. For producing a preparation with tapered, divergent walls and a flat floor. Also used for inlay/onlay preparation and to section teeth and cut bone. Cross cut burs have more cutting edges. For producing a preparation with straight, parallel, or minimally divergent walls with round internal line angles. Also used to gain access to carious dentin, establish preparation form, and create retentive locks. Cross cut burs have more cutting edges. Used to produce a flat preparation floor, refine preparations, and to mark the depth of bone reduction in crown lengthening. Help reduce any possibility of impacting the surface of the adjacent tooth with the cutting surface of a bur. Ensure a controlled cut for a smoother finish and reduce trauma to the gingival and adjacent tooth structure for better patient comfort. 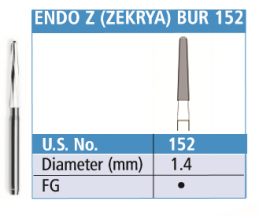 EF Series: For anterior and posterior gingival and subgingival contouring or margins. OF Series: For contouring and placement of occlusal grooves. JP 1: Ideal for removing PFM crown and non-precious metal. JP 2: Ideal for quick titanium abutment adjustments without the sparking associated with diamonds and for removing old restorations in secondary decay. Has six spiral blades for removal of debris, sectioning an impacted wisdom tooth before extraction, separating roots, and removal of a broken root stump. Has four blades for aggressive cutting of hard tissue or bone structure. Twelve bladed finishing burs (7000 series) provide a smooth finish on composite, amalgam, enamel, dentin, ortho debonding, and other dental materials. Best for controlled contouring and finishing. Thirty bladed finishing burs (9000 series) will eliminate most surface striations and, because the thirty blades remove less material per revolution, are recommended for use before abrasive polishing. Designed to reduce the “shiny dull” phenomenon and save additional polishing time. Best for final surface refinement, satin polishing, and use on ceramics because they produce a less aggressive cut. For contouring and finishing occlusal and lingual surfaces. For contouring and finishing restorations, root planning, bone contouring and smoothing. For refinement of preparations and contouring and finishing of restorations. Needle: For contouring and finishing interproximal margins, occlusal margins, facial surfaces, and cavosurface margins.